The main reason I bought a welder was to be able to build a custom arch. 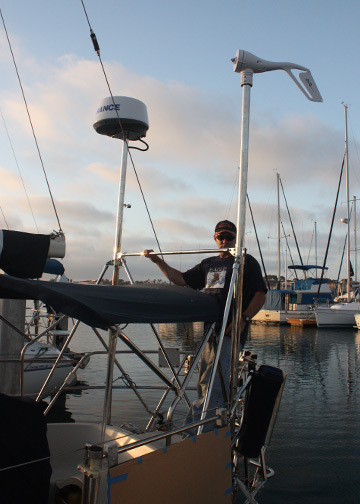 The problem I ran into was the design - I couldn’t come up with a decent design that would work well with the Monitor wind vane, not cover the bimini solar panels, look aesthetically pleasing and not weigh a ton. 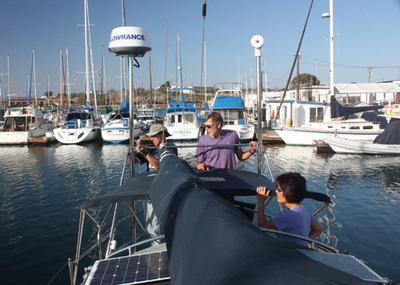 Any overlap of the bimini would be a problem due to space limitations for solar panels (see the solar panel page). If I came farther aft the arch would be in the way of the high wind vane as it flopped around in the wind. I have seen some arches built high enough to go over the top of the wind vane, but I discarded that based on aesthetics and the fact that I was putting a lot of weight too far aft. At one point I came up with a way for the arch to sit just in front of the backstay, overlap the bimini by only a couple of inches and sit only an inch or so higher than the bimini. 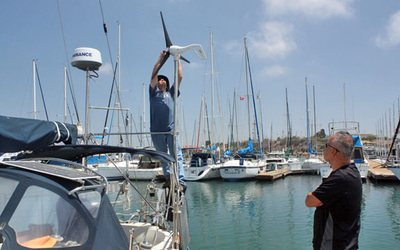 However, I still had to raise the wind generator high enough to avoid the boom and sail, and the radar would be more effective the higher it sat. The more I thought about it and the more I designed the specifics, it became apparent that a dual pole setup would look better, be easier to make, and be lighter than an arch. 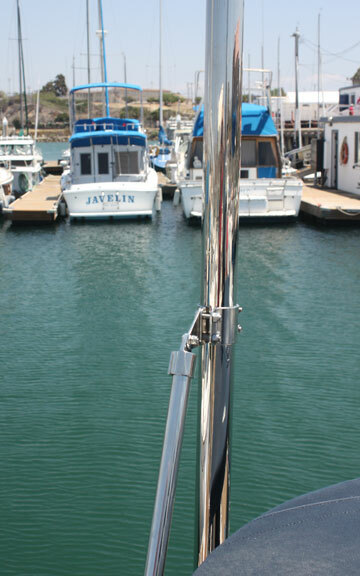 I began by buying the 2 ½” type 316 stainless poles. Once I settled on the height, I welded the top plate for the radar, and then went to work on the bottom connectors. The previous owners had a radar pole mounted at the stern of the boat, which I removed in order to mount the Monitor. In Maryland, they pulled the boat out of the water each winter and installed a winter cover. 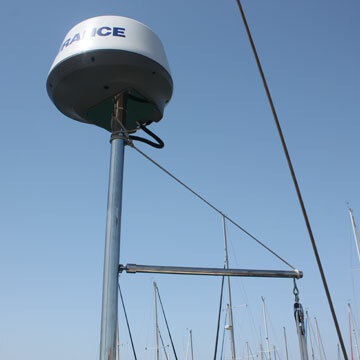 When they had the radar mounted they installed it in such a way that allowed them to lower the pole during the winter. Jay worked in the pharmaceutical industry and designed the system using medical/food grade stainless components. Pipe fittings are welded onto the ends of the pipe and are joined together with a gasket O-ring and clamp. 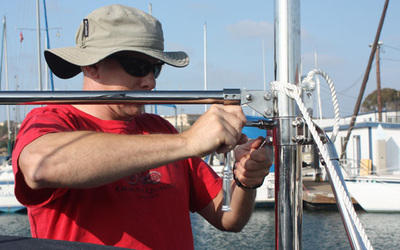 It is a simple, watertight and reliable system, and I wanted to replicate the same thing on my poles. I had a base plate made to bolt to my cap rail and the pipe fitting was welded to that. 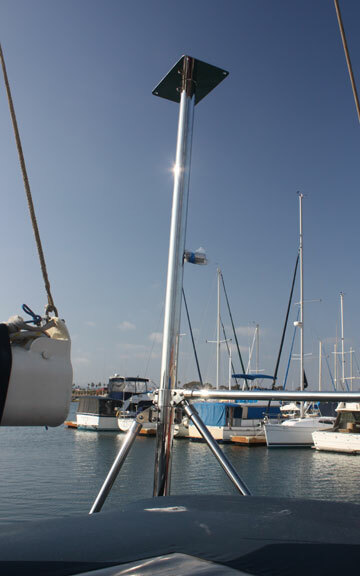 A matching fitting was welded onto the poles. 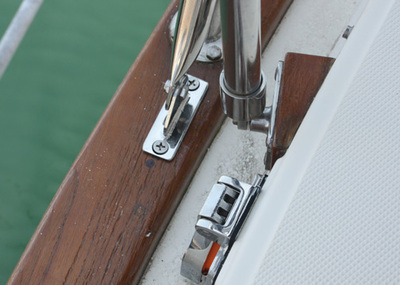 I had to make a shim out of Starboard to take into account the angles of the cap rail before bolting it together. For the stabilizing legs, I bought the hardware through Garhuaur Marine. 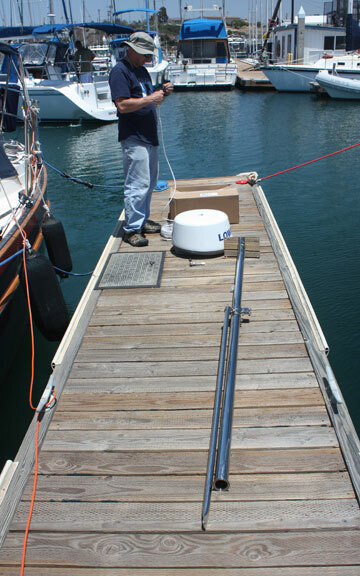 Once everything was aligned, I drilled the holes for everything and mounted the poles and struts. Afterwards, because I didn’t trust the stainless end caps from pulling off of the struts, I welded them up. The whole thing is as solid as a rock. 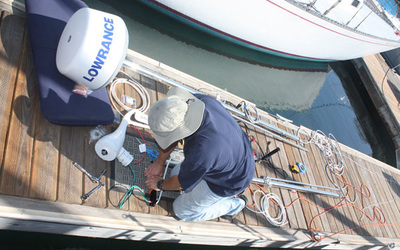 To minimize the number of holes in the boat, I ran all the wires I could through the poles and through the cap rail. 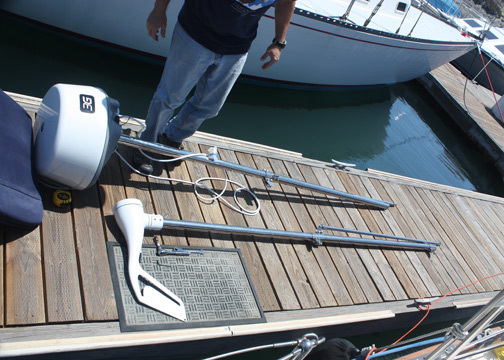 The radar pole has wiring for the radar, starboard solar panel, bimini solar panels, and AIS GPS antenna. 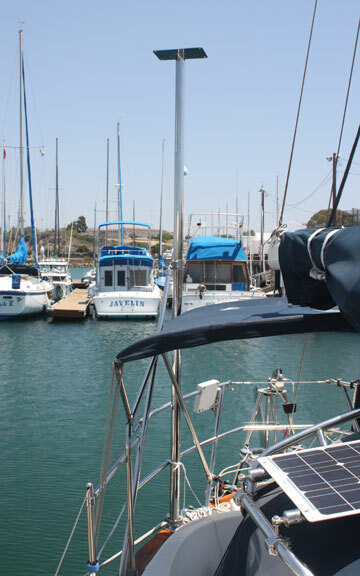 The port pole houses the wind generator and port solar panel wires. 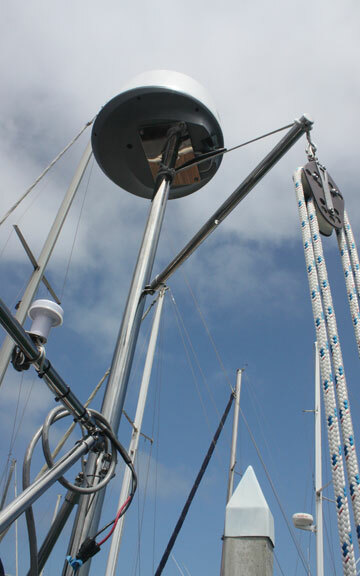 The radar pole was also a great place to make a dinghy motor hoist. 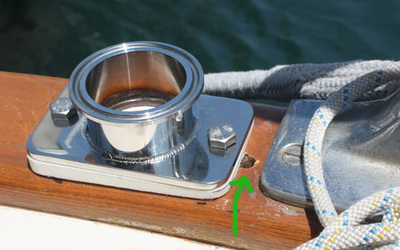 In this case I bought a single boat stanchion and welded an end cap to it. 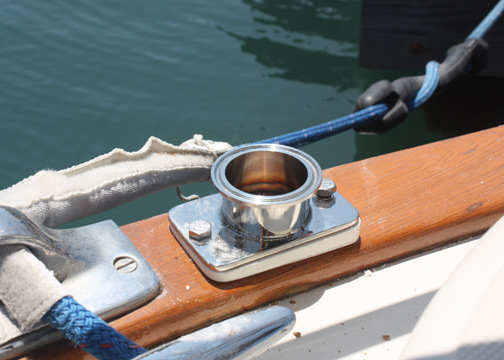 I welded two flanges to the pole to bolt the stanchion to, and then welded a small ring at the top of the pole. I spliced a piece of dyneema line, ran it through the ring and the end of the stanchion pole. 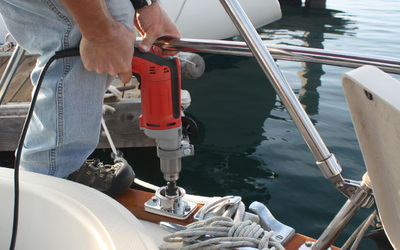 I attached a 4 to 1 block and tackle, and I now have an articulating, simple dinghy motor hoist. It’s strong enough to hold several hundred pounds, which is way more than my 4hp motor. 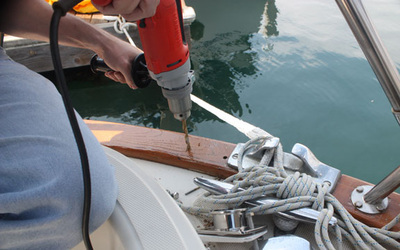 I’ve used it several times now, a couple times in really rolly anchorages, and it works so much better than trying to manhandle it up or down. 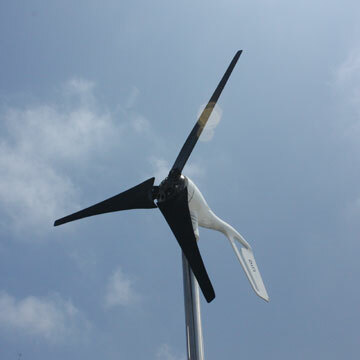 The wind generator almost didn’t happen. I have struggled with this one for a long time. I hate the sound of the damn things, I’ve heard a lot of people that weren’t happy with them once they bought them, and they are damned expensive even before you figure out how to mount it. 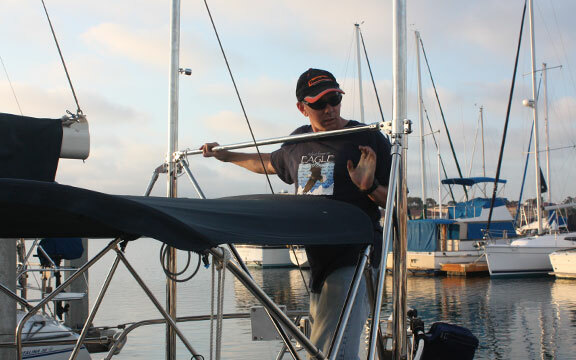 I spent a lot of hours searching the internet, reading Practical Sailor articles and anything else I could find on the subject. I was initially going to buy the D400. It was the most expensive but I could hardly find anyone who didn’t like it. The weight was a problem though, as it was the heaviest of all the gens out there. 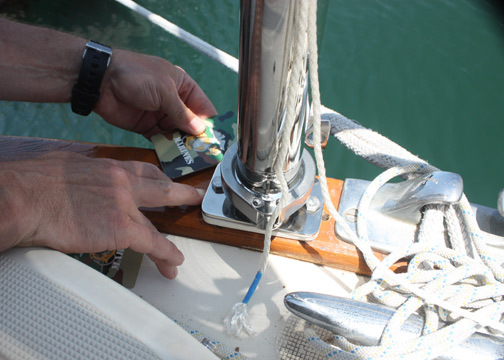 I was also running out of money and I had a hard time parting with the significant number of boat bucks needed. I then wanted to buy the KISS gen. It had pretty good reviews, was super simple and could be repaired by the cruiser, but the wingspan was huge and I didn’t trust the clearance between the backstay or the mainsail and the pole. So I was back to the D400 or the Air Breeze. The Air Breeze was half the weight, and significantly cheaper. A British sailing mag did a big test of multiple wind gens and pronounced the Air Breeze the winner based on 3 days of different winds. 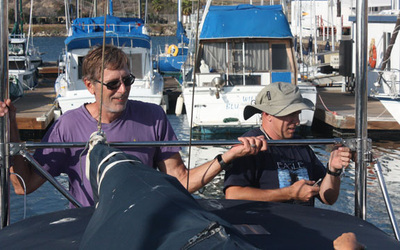 The D400 did great, but the Air did a little better in lighter winds. I was also worried about noise, and I knew the D400 was quiet. 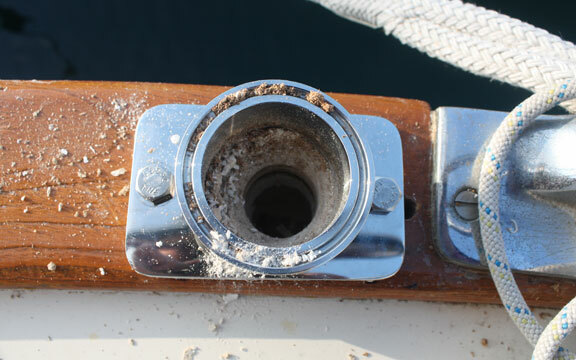 I read a bunch of sailing forums on the Air Breeze and it seemed that some people thought they were too loud, but others claimed they were pretty quiet. Most of the dislikes seemed to be from older models and it seemed that blade designs had changed recently. I still liked the D400 better, but price and weight won out. The Air manual says it will fit on 1.5” schedule 40 Aluminum pipe or 2” Stainless tube (incidentally, pipe is measured by its inside diameter “ID” and tube is measured by the outside diameter “OD”). But the tube is slightly bigger than the pipe and I had to find some thinner rubber liner (McMaster-Carr) than what came with the Air. I bought a meter/circuit breaker panel from E-Marine products and mounted it on the bulkhead over the refrigerator on the port side. Since the Air has an internal controller, it was a simple matter of running wires from the gen to the panel and then to the battery bus. I’ve had it now for a while and I learned a couple of things. First, beware of what you read in the forums. I read a couple of people trying to be helpful, but had no idea what they were talking about. They stated something to the effect that “my neighbor in the next slip has one, and I don’t hear it at all”. That’s because when the unit is switched to “off” it still turns slowly in the wind, makes no noise, but makes no power either. People told me they couldn’t hear mine either – when it was switched off. Again, it still spins but slowly. 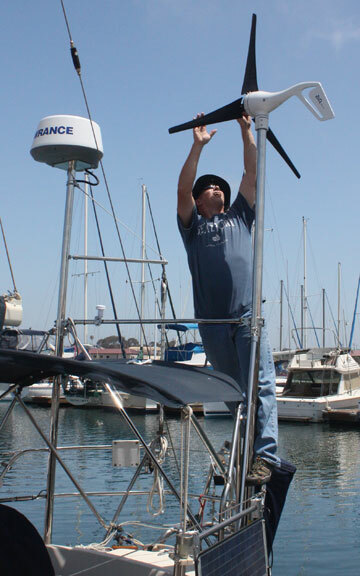 When the wind is up and I turn it on, the blades come up to speed and I’ve had people a dock away stop their conversation to look up to see what’s making so much noise. The blades are really noisy. So noisy, that I immediately ordered the blue replacement blades made by Silent Wind. Otherwise, I would have sold the thing the next day. The blue blades, however, have proven to be nearly silent. Now, when the wind is up and its cranking, I hear the noise of the generator over the blades. Second, the generator doesn’t produce any usable amps until the wind is over 15 knots sustained. Otherwise, it spins, makes noise and doesn’t do much else. I have not been impressed with it so far. However, I almost always have enough sun to do the job, and haven’t seen a lot of 15 knot sustained here in the Sea of Cortez so far. Being in a protected slip where we don’t get a lot of wind doesn’t help. I think it will be much more useful in the steady Pacific tradewinds. Ahh. Good to know even my MacGyver can make a mistake. Too close to the existing backing plate. Notice we had to place the port one a bit further forward to avoid obstacles under the caprail. Also, notice the Starboard leveling plate underneath. Stainless steel pipe clamp allows for pole removal. Radar side is supported by an arm placed just forward of the stanchion. Here is the base of that arm. More caprail drilling involved. Same on other side. Is it vertical yet? Basically had to eyeball it. OVER and OVER and OVER. Attention on deck...ready to go. Big mess o' wires. Wiring down through the poles was not fun. Radar and wind gen now installed on pole tops. Finally putting up the poles 'for reals'. Friends willing to help hold things in position were key. The 'pole holding' jokes just couldn't be helped. Finalizing the cross bar. Brian can actually hang on it. 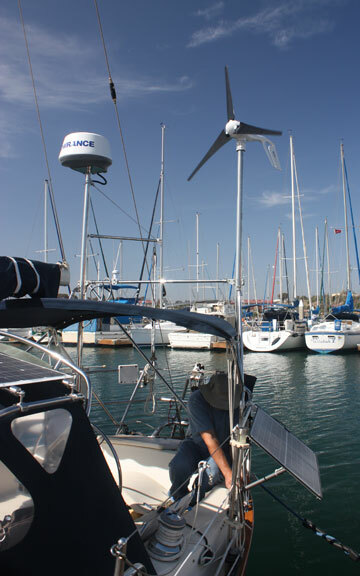 Changing to the blue Silent Wind blades. Master Guns, does it meet your approval? Brian was so annoyed at the noise that he changed out the blades within a week, I don't even have photos of the originals.